The three-roller Plate Rolling Machine is a kind of upper symmetric roller with the two lower rollers driving the upper roller. It can roll metal plates into round, arc and some cone-shaped work piece. It is widely used in shipbuilding, boiler, aviation, hydropower, chemical industry, mental structure and mechanical manufacturing industry. 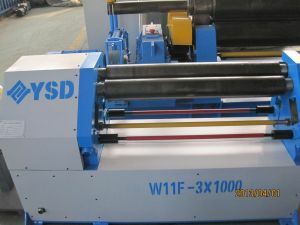 The three-roller Plate Rolling Machine with top roller coated with segmented rubber (plastic) can be used to bend composite panels. Different models of Plate Rolling Machine can be further classified based on the length with or without prebending, heights of top roll and bottom roll, motor power as well as working speed. We, as professional Hydraulic Rolling Machine Supplier can provide you different kinds of specific products as per your requirements.